The wholly indigenously developed Train 18 crossed the 180kmph barrier during a trial run. It is set to become India's fastest train when it starts operations. For long, there has been talk of bringing the bullet train to India, and while the country still waits for the Japanese marvel to make its way here, our own indigenous engineers have developed the next best thing. Dubbed Train 18, India’s first locomotive-less train, has reportedly breached the 180kmph speed mark on the Kota-Sawai Madhopur section. Unlike current trains plying on the railway network, Train 18 is not ferried by an engine at the front, and instead, each bogey has an electronic motor that propels it, just like the way the Metro works in Delhi and Mumbai. The train is a wholly indigenous project being developed by the Integral Coach Factory based in Chennai. When talking about the possibility of commercial runs, S. Mani, General Manager of Integral Coach Factory in a quote to IANS said that “We expect Train 18 to commence its commercial run from January 2019. Normally the trials take three months. But now it is happening faster than expected.” Mani had earlier told IANS that if all went well, Train 18 would replace the current Shatabdi Express — a day train. 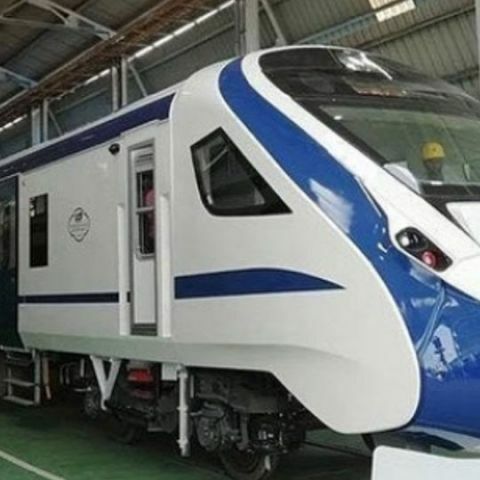 Train 18 has the capacity to ferry 1128 passengers in 16 bogies with the first two bogies being first-class, having a capacity of 52 seats each. According to the plan, Train 18 is set to first commence between Delhi and Varanasi, with the hopes of a December 25 inauguration. As of the tentative plans right now, the train will leave Delhi at 6:00 a.m and arrive at Varanasi at 2:00 p.m. The return journey would commence at 2:30 p.m with the train arriving in Delhi at 10:30 p.m. The speedy turn-around time is attributed to the driver bogies at both ends of the train. Traditional trains require the engine to detach at one end and make a trip around the track at the other end before making the return journey, often causing major delays. While Train 18 is going to be operating at 160kmph speeds, 30kmph faster than the Shatabdi, its real achievements lie in all the savings. The train features regenerative breaks which should result in up to 30 percent energy savings. It will also have a smaller carbon footprint than the current Shatabdi Express. Train 18 will also be a wholly air-conditioned train, offering amenities such as onboard infotainment and Wi-Fi. Ferrari may actually make an SUV, eventually! As of now Train 18 is still under trial runs and while it would be exciting to have the train ply across various destinations, there is still one major challenge facing its rollout. According to an internal report by the Indian Railways, only 0.3 percent of its track is capable of supporting speeds as high as those that would be achieved by Train 18. What this means is that as the ICF readies the train for Indian rail-roads, the Indian Railways will also have to work quickly on upgrading tracks across important sectors. Which is the Best HTC set available in market ?